So this year has been a remarkably same old, but brand new. In my round up for 2015 my goal was to Diversify…yet focus. I’d implemented 2 week sprints midway through 2015, and also reduce the amount of sites I looked at in the year. 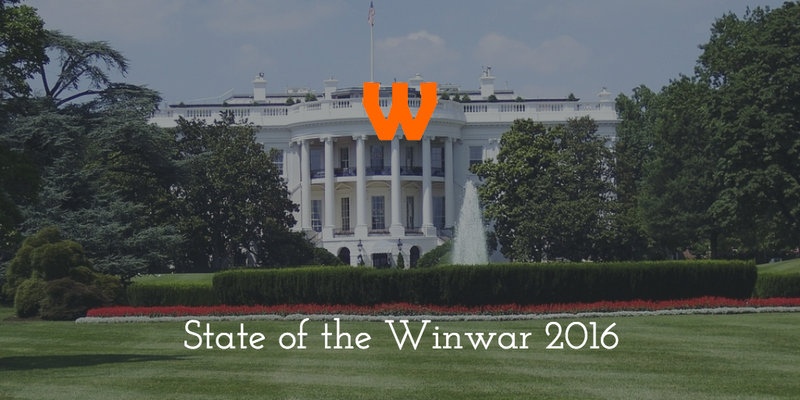 Nevertheless it’s been a great year for Winwar Media, as although 2015 and early 16 stagnated, there has been a renewed focus in 2016, that saw improvements. I’d love to share my thoughts with you now. I feel that in 2016 whilst I had a focus, I didn’t necessarily have longer term goals in mind. Often things that would crop up that would take priority over other things. Often the cropped up things would take precedent, which I feel harmed my goals. As such, I’ve now been thinking a lot more about the big picture, and ended up in early November 2016 mapping out my goals for 2017. This has allowed me to focus on things that are key to my goals, and abandon things that aren’t. Case in point – last year I talked about my Saas idea. It was done as a learning experience and manifested itself as PPV Press Play. Although I learned a lot from it, it didn’t become a success. Whilst building that though other things suffered. One thing that I struggled with was content. Writing article after article is quite hard, especially as a one man band. As I looked to focus on my bread and butter – WordPress plugins – the content on this site dropped (as well as on WP Email Capture). This suffered on this site, so I’ve now got a plan on how to structure content going forward, plus a bit of relief on another of my site. So hopefully with 2 posts up in a month, plus a newsletter, plus more updates on our Facebook Page, we won’t have months of silence like before. So the coolest thing to happen to me this year is that, midway through 2016, WP Email Capture had a sudden and slightly unexpected upturn in sales, which has maintained for the rest of the year. This has mean that I have managed to be able to take on more help for the site! This has seen an Administrative Assistant start at the end of October. She has taken a huge weight off my back when it comes to blog posts and preparation for things to go live, which is a great help! So the same as last year here’s a roundup of stats for my 3 main sites between 2015 & 2016 from January to November. Like last year I’m not sure what to provide knowledge wise, so if you have any questions, or insights you want, feel free to put it in the comments. Traffic is down -5% on the same period on last year. Interestingly the drop in posts seem to have had an effect in the amount of traffic I have received. The most visitors on one day was 98 on the 24th November (when the Black Friday deals started). The most popular post was How to Get Posts Page URL Dynamically in WordPress, the most popular post from the year was the post looking at Alternatives to Social by Mailchimp. The most popular Plugin page was WP Taxi Me Premium. Traffic is down -15% on the same period on last year. This is unsurprising as it has been lying relatively stagnant for a while. Though we have launched a few more products this year. I’m looking at reviving this heavily next year, and taken steps already to improve this. The most popular post was WP Email Capture 3 Being Released. This has been a success story of the year. Traffic is up 25%. This has gone from strength to strength as it’s the most popular site in it’s niche, and allowed me to get help on it so I can focus on Winwar Media & WP Email Capture. The most popular page is the Wrestling Betting Sites Comparison Guide page (up 25% on last year), but the most popular post was oddly the WWE Backlash 2016 Betting Tips page, largely because it was shared heavily on reddit. Anyway, that’s been my 2016, and my focus on 2017. Where has your head been? Please let me know in the comments!